1 How much is a tour to visit Persepolis? Persepolis is probably the number one reason for many to visit Iran and certainly a spectacular place full of history. Persepolis was the ceremonial capital of the Achaemenid Empire (from 550 to 330 before Christ). It is located about 70 km north of Shiraz and the whole complex is declared as a world heritage site by UNESCO since 1979. The name we know, Persepolis, derives from the Greek “Persian city”, But if you are one of those travellers who talk to the locals soon you will learn that they know him as Takht-E-Jamshid, which means “the throne of Jamshid”, a king belonging to the fishdadiyya dynasty and an Iranian mythology describes him as the Four Greatest King in history. The city main purpose is still not clear, even with its huge extension of more than 125.000 m2 was not the largest city in Persia, but it was a place of ceremonies that was visited only on some special occasions, like for example during the celebration of the Nowruz, the Iranian new year. Such was the level of “ignorance” that not even the Greeks had knowledge of it, at list not until Alexander the great invaded it in 330 a. It is also not clear if the fire that ended up destroying the city was accidental or a work of revenge for the burning of the Acropolis of Athens during the second Persian invasion to Greece. In addition to the fire, the time deteriorated the city until its first excavations in 1930, where it began its restoration. 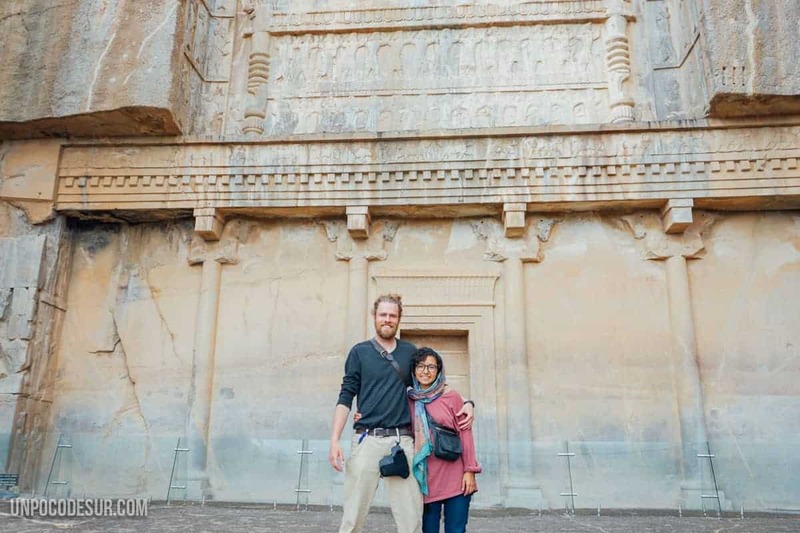 And now that you know a little bit more about this fascinating place we are here to tell you our secrets because we know that it is possible to visit Persepolis for less than 6 € per person (entry of 4 € included) and we want to show you how to do it. How much is a tour to visit Persepolis? Many tourists choose the option of a tour which includes both transport and the entrance ticket, usually costs between 1.000.000 and 1.200.000 Rials per person (about 25 €) and if you like it easy there is no problem hiring him in Shiraz, they offer it everywhere. Another big group of tourists come from Shiraz and hire a taxi drive them during the da, take them to the complex and finally bring them back to the city. Most of the taxis offer the return service for about 900.000 Rials (about 20 €) for the whole car, it is also possible to hire one for a single way, without the waiting the price would be around 300.000 for the whole car (about 6 €). To be honest, I don`t think is necessary they wait for you, there are a lot of taxis waiting at the doors and I’m quite positive you will find taxi driver for the way back. Obviously, if they offer you a good deal the best is to go with everything already closed. If you are a group without a doubt it is an almost unbeatable price. 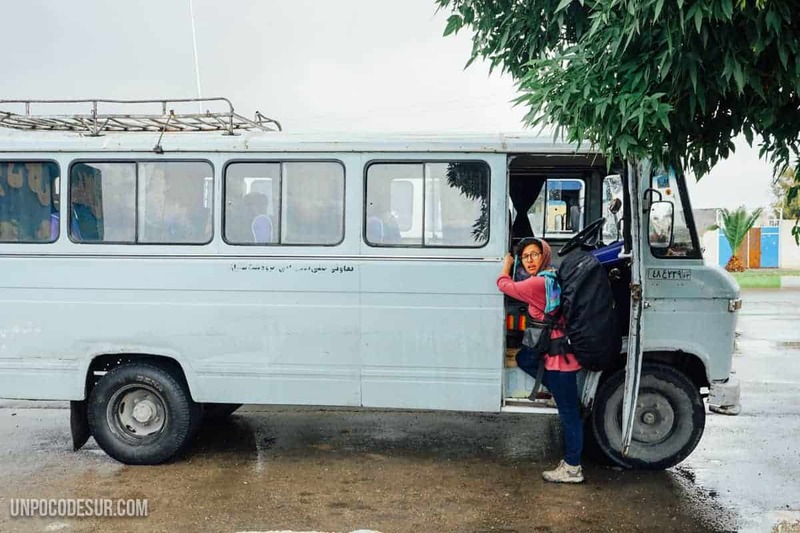 What many people do not tell you is that it is completely possible to arrive to Persepolis with public transport, to do it you just have to take a bus to Marvdasht, which will take about 45 minutes and 15.000 Rials per person. Once in Marvdasht, you can take a van or small bus to Madieh town (take it to as far as you can) and from there you can walk the last 2 km or take a short taxi to the entrance. In total, the price was 45.000 rials for both return to Shiraz so 22.500 rials per person per journey, 1 € per person return. 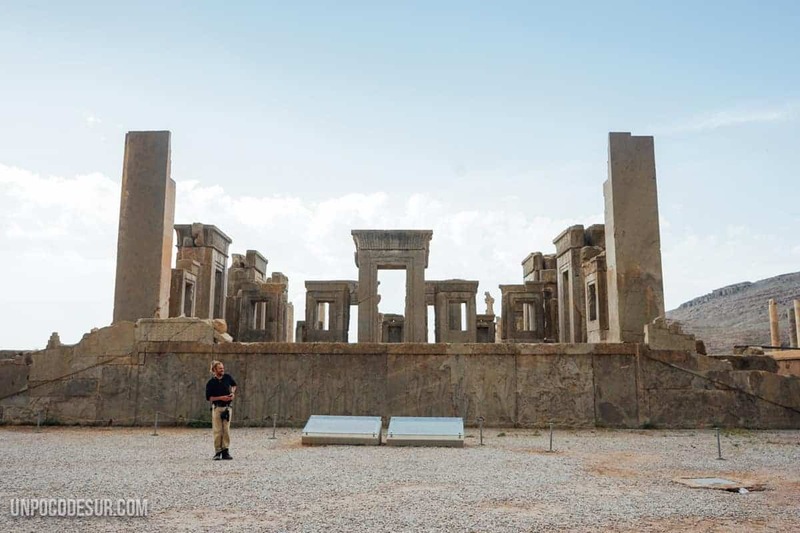 As you have read in one of our latest stories we arrived at Persepolis Hitchhiking from Yazd. If that’s your case but coming from Shiraz you most likely have to take route 65, the main one and ask you to be drop down at the intersection where the walk to Persepolis begins, from there you can walk about 6 km but if you wait there will be probably taxis around considering the Number of tourists and taxis in the area. We first visited Naqsh-e Rustam and from there we walked a couple of km to find a taxi, for 80.000 rials took us both to Persepolis. 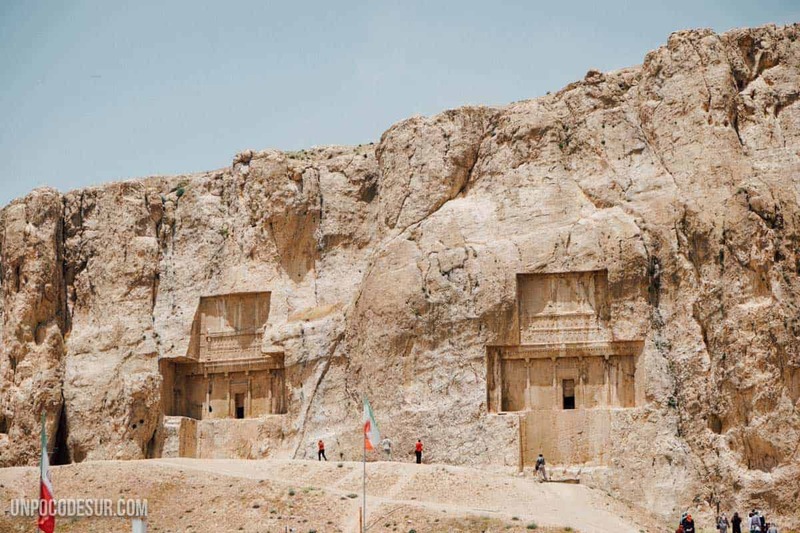 Many taxi drivers and tours will offer you to visit Naqsh-e Rustam, a few km from the enclosure, honestly, being the ticket at 200.000 per person we don’t think it’s worth the price, you’ll find similar graves inside the Persepolis enclosure. When you enter you can see a small audiovisual piece with history about the city, we recommend it, especially if you go without a guide. Wear proper shoes, you’ll walk a lot. If you go with big backpacks (we arrived with our big ones from Yazd) they will make you leave them in the lockers for free, it’s actually great so you don’t carry things around. Drinks and food inside the enclosure are expensive, so take enough water with you. If you go without a guide try to get informed before and, if you have time, like us, don’t be afraid to stop and listen to some groups (do not follow them around, come on) or just walk around with Wikipedia, a good friend of us. With all this said please enjoy your visit and if you have something to add or updated information do not hesitate to leave it in the comments.